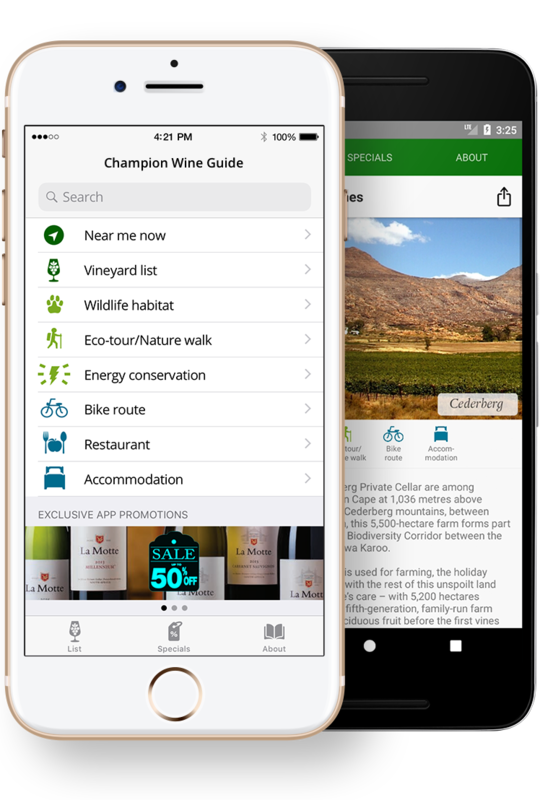 Explore South African WWF Conservation Champion wine farms using this Android or iOS app. As Conservation Champions, these wine farms are acknowledged as environmental leaders in the wine industry for their commitment to conservation, responsible production practices, integrated environmental management systems, and spearheading innovations in water, energy efficiency and climate adaptation. Wine lovers, locals and tourists are encouraged to use this guide to discover nature at it’s finest – from fynbos walking trails and cycling tracks, to seasonal menus at scenic restaurants and special places to relax.